Download "Spring 2015: Gordon State College. Barnesville, GA Online Course: Econ 2106 Microeconomics. Course Meeting Time and Location: Internet (D2L)"
1 Spring 2015: Gordon State College. 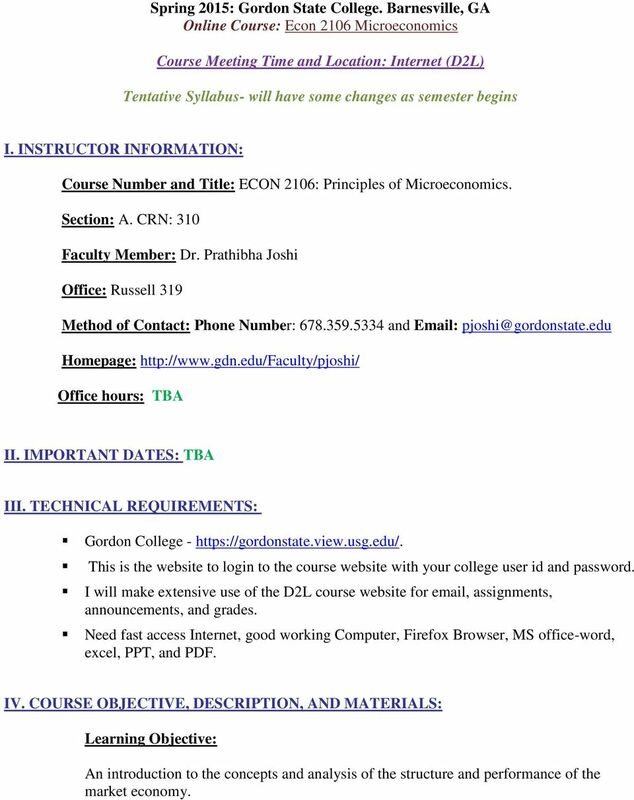 Barnesville, GA Online Course: Econ 2106 Microeconomics Course Meeting Time and Location: Internet (D2L) Tentative Syllabus- will have some changes as semester begins I. INSTRUCTOR INFORMATION: Course Number and Title: ECON 2106: Principles of Microeconomics. Section: A. CRN: 310 Faculty Member: Dr. Prathibha Joshi Office: Russell 319 Method of Contact: Phone Number: and Homepage: Office hours: TBA II. IMPORTANT DATES: TBA III. TECHNICAL REQUIREMENTS: Gordon College - This is the website to login to the course website with your college user id and password. I will make extensive use of the D2L course website for , assignments, announcements, and grades. Need fast access Internet, good working Computer, Firefox Browser, MS office-word, excel, PPT, and PDF. IV. COURSE OBJECTIVE, DESCRIPTION, AND MATERIALS: Learning Objective: An introduction to the concepts and analysis of the structure and performance of the market economy. 2 Course Description: Microeconomics focuses on the individual behavior of households and firms that maximize their return. The cost and production structure is examined to find out how firms make decisions and maximize profits. The analysis of the structure and performance of the market economy is studied by investigating the four markets namely perfect competition, monopoly, monopolistic competition and oligopoly. In addition, some analysis will be done with regard to public policy and its impact on society. 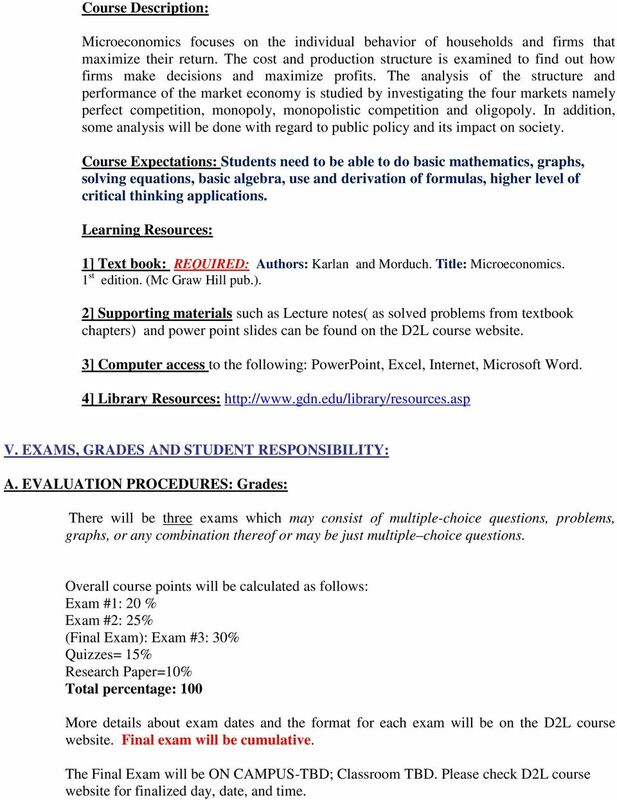 Course Expectations: Students need to be able to do basic mathematics, graphs, solving equations, basic algebra, use and derivation of formulas, higher level of critical thinking applications. Learning Resources: 1] Text book: REQUIRED: Authors: Karlan and Morduch. Title: Microeconomics. 1 st edition. (Mc Graw Hill pub.). 2] Supporting materials such as Lecture notes( as solved problems from textbook chapters) and power point slides can be found on the D2L course website. 3] Computer access to the following: PowerPoint, Excel, Internet, Microsoft Word. 4] Library Resources: V. EXAMS, GRADES AND STUDENT RESPONSIBILITY: A. EVALUATION PROCEDURES: Grades: There will be three exams which may consist of multiple-choice questions, problems, graphs, or any combination thereof or may be just multiple choice questions. Overall course points will be calculated as follows: Exam #1: 20 % Exam #2: 25% (Final Exam): Exam #3: 30% Quizzes= 15% Research Paper=10% Total percentage: 100 More details about exam dates and the format for each exam will be on the D2L course website. Final exam will be cumulative. The Final Exam will be ON CAMPUS-TBD; Classroom TBD. Please check D2L course website for finalized day, date, and time. 3 Exam I, Exam II and Final Exam times and dates will be posted on the website. Final Exam will be on Gordon State College CAMPUS. Students must come to campus to take their final exam, as per the Gordon State College requirement. THERE IS NO MAKE-UP FOR MISSED CLASS WORK. Regarding Quizzes quizzes are online and timed. Hence there is no make-up for the quizzes if you miss the deadline. Also remember these quizzes are computer-generated and so I will be unable to tell you which quiz question you missed. However, if you have a particular question that you had difficulty with, please make a note of it and me. Due to time constraints, please be considerate about your requests. Please note that the quizzes are open-book. Regarding the research paper, each student will do a research paper on a company. I will provide some names of companies from which you can choose to do your research paper. The date for the paper submission will be announced early during the semester; if you do not submit your paper you will receive a grade of ZERO. I will provide all the instructions on the D2L course website. Please check your D2L periodically. You may contact me through for questions, appointments, and so on. I check my during office hours. I will not respond to s that ask questions already covered by the syllabus or can be found on the Gordon College website. If you need any help with this course, please contact me. B. SUBMISSION OF WORK Exams must be taken on the dates assigned. 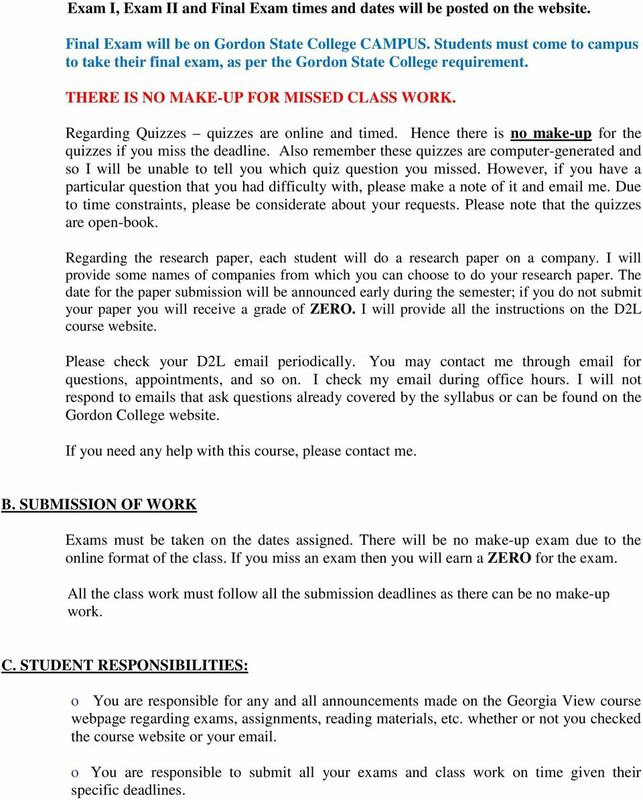 There will be no make-up exam due to the online format of the class. If you miss an exam then you will earn a ZERO for the exam. All the class work must follow all the submission deadlines as there can be no make-up work. C. STUDENT RESPONSIBILITIES: o You are responsible for any and all announcements made on the Georgia View course webpage regarding exams, assignments, reading materials, etc. whether or not you checked the course website or your . o You are responsible to submit all your exams and class work on time given their specific deadlines. 4 o You are responsible to participate in the discussion and submit all your assignments, quizzes on time given their specific deadlines. o You need to study and teach yourself the course. Please find time to do so regularly. o Do Not use cell phones during the exams, even to check the time. D. STUDENTS WITH DISABILITIES: Students with a disability that requires assistance or class accommodations or any accommodations for testing should contact the Office of Counseling Services. 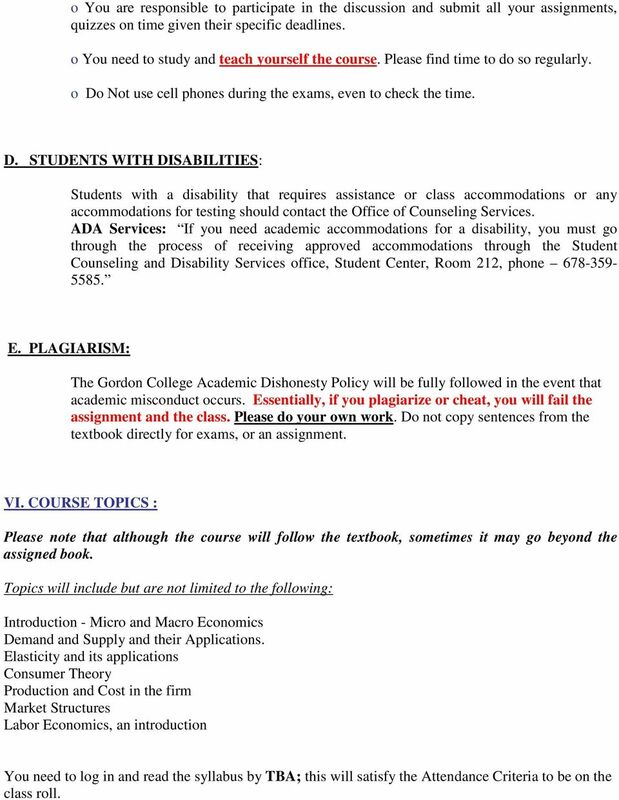 ADA Services: If you need academic accommodations for a disability, you must go through the process of receiving approved accommodations through the Student Counseling and Disability Services office, Student Center, Room 212, phone E. PLAGIARISM: The Gordon College Academic Dishonesty Policy will be fully followed in the event that academic misconduct occurs. Essentially, if you plagiarize or cheat, you will fail the assignment and the class. Please do your own work. Do not copy sentences from the textbook directly for exams, or an assignment. VI. COURSE TOPICS : Please note that although the course will follow the textbook, sometimes it may go beyond the assigned book. Topics will include but are not limited to the following: Introduction - Micro and Macro Economics Demand and Supply and their Applications. Elasticity and its applications Consumer Theory Production and Cost in the firm Market Structures Labor Economics, an introduction You need to log in and read the syllabus by TBA; this will satisfy the Attendance Criteria to be on the class roll. 5 If you do not check D2L class webpage you will be dropped from the class. You will have to contact the registrar s office to get reinstated to the class. The student is responsible for all the work during that time. Please Note: 1. College algebra or a college math class prior to taking an economics is beneficial. 2. This class will have math, formulas, and graphs. You need to be able to do this and be comfortable. The multiple choices will be math, formula, graphs, and application oriented. 3. This is one of the Challenging college classes you would take in college. 4. This course is very APPLIED in nature and not an easy class. If you have constant difficulty understanding the material; it will be beneficial to take a face-to-face class. Mathematics for Business and Economics ( MATH 3210 WEB ) SPRING 2016 Instructor: Dr. Sankara N. Sethuraman Please call me Dr. Sankar. COURSE INFORMATION. 3. You learn the course policies and follow them. Elementary Statistics Online ( MATH 2210 WE4 ) Summer 2015 Instructor: Dr. Dharma S. Thiruvaiyaru Please call me Dr. Dharma. Office: Office Hours: Allgood Hall, Room E351 Monday to Thursday from 2:30 p.m.